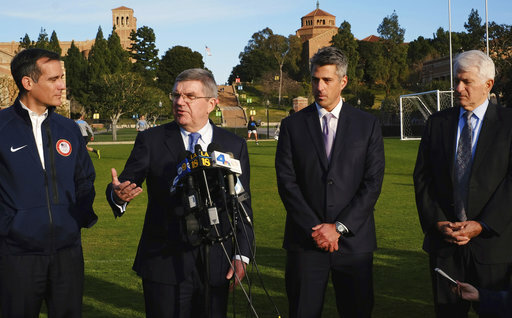 That is a possible double vote IOC President Thomas Bach has repeatedly hinted at, which could give Los Angeles and Paris either the 2024 or 2028 rights in September. Minutes later, Paris officials went on stage and focused on winning a contest that is still only about 2024. For now. “We thought it was obvious to talk about,” Wasserman told reporters after both teams completed 10-minute presentations that both overran. Still, LA is not offering to stand aside to let Paris have 2024 — exactly 100 years after the French capital last hosted the Olympics — and willingly take a hosting duty 11 years away. Citing Paris Mayor Anne Hidalgo as a good friend, LA Mayor Eric Garcetti told reporters that the cities could start as “friends not competitors” if the IOC formally starts talks to open up the 2024 rules to include 2028. Hidalgo got her shots in at LA earlier as both teams traded pointed barbs on stage that stayed within the IOC rules of courtesy and not criticizing an opponent. The Olympics were “more than just a branch of show business,” Hidalgo said, switching from French to English to make sure LA’s Hollywood-backed bid got the hint. “Our bid is not a government project with all the risk and uncertainty that that implies,” Wasserman said, promoting LA’s privately-funded project against Paris’ need for taxpayer cash to meet 3 billion euros ($3.2 billion) of spending on new venues and buildings. That dug at fresh IOC scars from tangling with multiple government layers in Rio de Janeiro and Tokyo, the 2016 and 2020 hosts where bidding budgets were hit hard by reality. Paris’ boast of “quick reliable transport based on a realistic and tested plan,” struck back at LA’s image as a car-choked city. Hidalgo also trumpeted the Paris bid’s environmental credentials, evoking the global climate accord that was forged in the city during the Obama administration, yet is little respected by the current U.S. president. “We are a team you can trust,” was Paris bid co-chairman Tony Estanguet’s message to the audience of Summer Games sports federations. Tuesday’s event at an annual conference of Olympic officials, with about 20 IOC members present, was the first of three official campaign events this year. The next is at a meeting for the full IOC membership on July 11-12 to hear detailed technical analysis of the cities’ hosting projects. It follows a two-day IOC executive board meeting which will take a report from Bach’s four vice presidents who he has asked to advise on staging a double vote to avoid losing either coveted city. The race is set to be decided at the annual IOC session scheduled for Sept. 13 in Lima, Peru. Bach did not attend the city presentations, though he met with both mayors on Monday. Earlier Tuesday, he praised both bids. “We have two excellent bids which are embracing Olympic Agenda 2020 by making use of many existing facilities, by having a sustainable project, by having very low infrastructure investments compared to previous bids,” Bach told The Associated Press.